Today was a bit better for traders and private buyers alike. 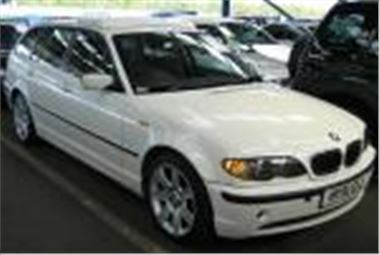 Someone bought the 2001/51 facelift BMW 330dSE Touring auto in the photo for just £5,450. True it has been damaged and repaired, the autobox was playing up and, since it had been a police car, only a fool would attempt to clock it. But there’s never been a cheaper facelift 330dSE Touring auto. Big South Korean cars never had blue chip residuals, so I thought an 80k mile 2001/51 KIA Magentis would struggle to reach £3k, yet this one ran to £3,400, so only lost £10k over 80k miles. A few cars later a 70k mile 2001/51 Hyundai XG30 reserved at £3,900 sold for £4,000 which meant a slightly bigger bath of £17k. Whoever bought a 2,000 mile 2002/52 reg Renault Kangoo 1.4 Authentique auto for £6,500 stood to make a couple of grand, because it was fully fitted with a Gowrings drop-floor wheelchair ramp: the type that allows the wheelchair occupant to wheel in and sit beside another person at normal height and in dignity. Find the right family via the disability websites and they would gladly pay £8,500 for one of these. A 16k mile 03 reg Mazda 6 2.0TS sounded very much like a diesel to me, so £9,350 allowed a decent forecourt margin. An 8k mile 2004/53 facelift model Nissan X-Trail Sport with the 2.5 litre petrol engine left some profit at £13,350. While a 5k mile 04 reg Audi TT 3.2 DSG was marginal at £24,400 compared to the current level of broker discount for a UK supplied new one. A few notches down, five-year-old family saloons were looking a bit dearer than they were in the summer. Someone paid £1,950 for an admittedly very clean pale gold 99V Mondeo Ghia with 111k miles. A 57k mile 99S Primera 1.6Si sold for £2,000. And a 72k mile 98R Honda Accord 2.0SE made £2,200. Among the out of the ordinary, a 22k mile 03 reg SAAB 9-3 2.0T Vector bid to £12,550 and a 40k mile 99T TVR Chimaera bid to £13,100, and a 73k mile 02 reg Lexus LS430 sold for £20k. Top Car at Blackbushe on Monday. As always the best way to look for a specific car coming up at auction or to pre-check a day’s sale is to visit www.auctionview.co.uk This service also now gives composite price information (average auction price, CAP and Glass’s) and allows you to buy directly on-line.